A few doors up there’s two of the most beautiful Red Gum bushes ever and they’re in full bloom at the moment – the lorikeets love them & I can hear them squawking right now, so the blooms won’t be around for long (it still seems strange living where parrots fly around, even after 11 years). 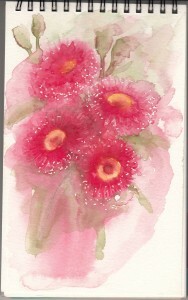 I promised myself last year I’d try & paint these pretty flowers but after lots of excuses it never happened. So I decided to have a go today, before they all disappear for another year, they look so amazing! My first try (roughly A4) was fun but the colours turned out a bit basic. I tried to paint some detail into a second glaze but it just feels wrong, I really struggle with backgrounds… mind you, it looks better up here than in real life :-). 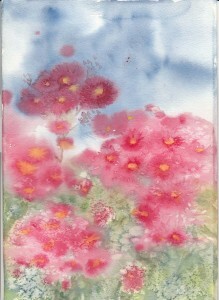 I had trouble with the greens too… all mixed by hand as I know they ought to be, but they look too bright. 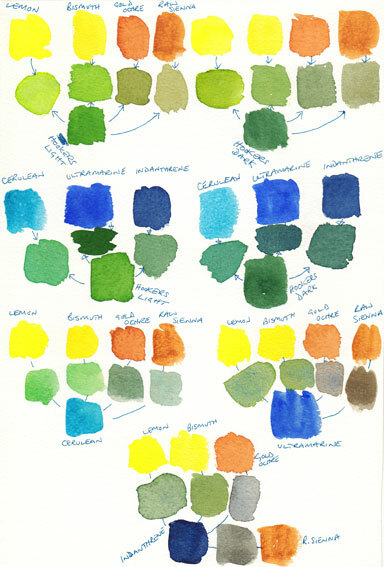 So, after some quick research I decided to paint a sample of all the greens I could get from the colours I have. Yes, something I should have done first. As result I’ve discovered that none of the primary colours I own mix good greens, so I might have to do some shopping! Mixing the two ready made greens I have with other colours gave some reasonable results though, so that should keep me going. Lastly, I tried to paint just the flowers, aiming to get a more realistic look (and colour!) & focusing on just a couple of blooms. I received a tiny masking fluid dropper for Christmas, and you can see it does a fantastic job of tiny dots. Shame I hadn’t put an under wash on first, the dots are a too white! 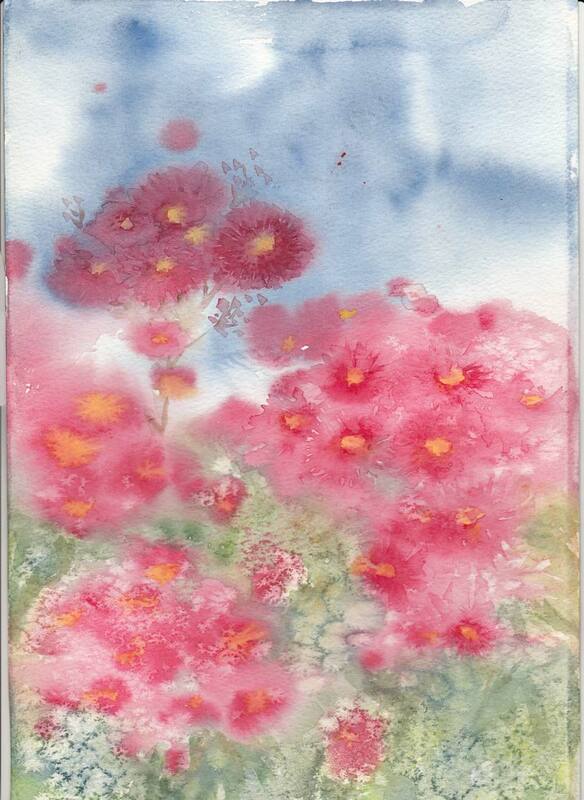 Again I struggled with the background, and the flowers are also very overworked – I must learn to wait for things to dry before trying to correct them, or better still, get them right to begin with. 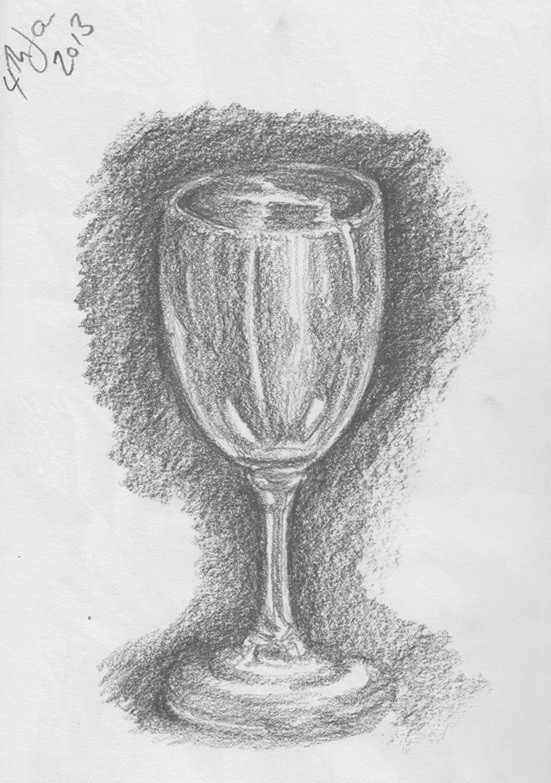 I’d love to be flowing and loose in style, but I’m not managing the water & colour ratios at all. Not bad for a first go though, more tomorrow…. 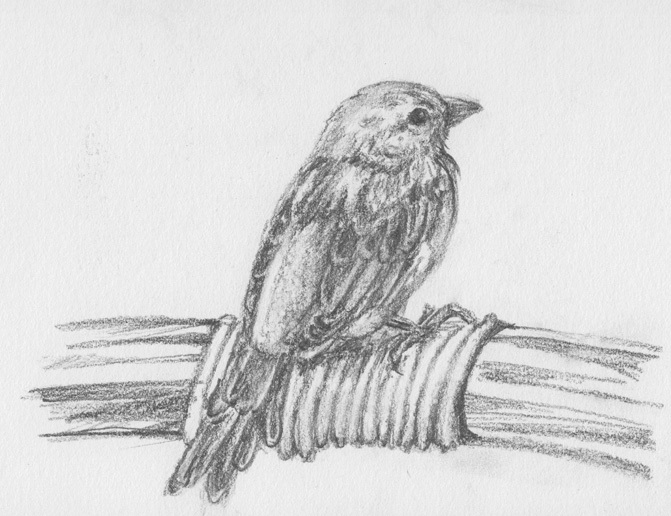 I’ve another sketch to share today, of a tiny sparrow we saw on our recent trip to Noumea. They were definitely sparrows, cheeky little blighters, stealing food from all the tables…but they were the tiniest ones I’ve ever seen! The photo it was sketched from actually has three sparrows on the back of a cane chair but I only had time for one of them today having spent the whole afternoon working on this website to make it a bit more user friendly and up to date. As soon as I have an idea of how to tackle it I’m planning on painting a watercolour of all three. About this time last year I suddenly found myself without a job & decided it was a perfect time to build a website – after all, I’d owned the domain name for at least 2 years. A year later it looks exactly as it did then: a few images, some self conscious information about myself and a hopeful contact page….. all pretty embarrassing & not surprising no-one visits. The challenge: to create something every day and to share my journey in gory detail. Inspiration for completing such a challenge came from various sources: articles that seem to appear every time I sit at my PC with stories of people who’ve documented their progress in a chosen quest & the effect it has had on their life & work. Today the whole subject reached critical mass for me (hence the title). I watched Jonathon Fields interviewing Lisa Congdon about learning a new skill and sharing her progress on a daily basis. As she began to gather an audience she couldn’t shirk from her commitment to post &, inevitably, practising continuously made her improve so much faster. They also discuss the issue of going public while learning, of not being perfect – now this, I think, is my personal mountain. Lisa’s response is that you have to put yourself out there in order to move forward: that if you wait for perfection you may wait forever. So, the penny has finally dropped. At last I understand that if I can commit to practising regularly and sharing the results then my confidence, as well as my skills, will grow… and much more rapidly.